There’s more to speech recognition apps than Siri, Cortana or Google voice search, and a San Francisco startup called Expect Labs aims to prove it. On Thursday, the company announced it has raised a $13 million Series A round of venture capital led by IDG Ventures and USAA, with participation from strategic investors including Samsung, Intel and Telefonica. The company has now raised $15.5 million since launching in late 2012. Expect Labs started out by building an application called MindMeld that lets users carry on voice conversations and automatically surfaces related content from around the web as they speak. However, that was just a proving ground for what is now the company’s primary business — its MindMeld API. The company released the API in February 2014, and has since rolled out specific modules for media and ecommerce recommendations. 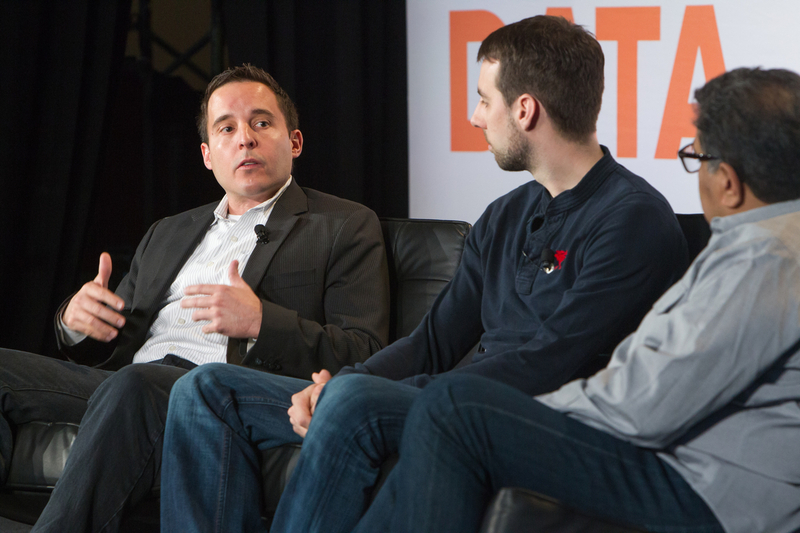 Tim Tuttle (left) at Structure Data 2014. API users don’t actually have to incorporate speech recognition into their apps, and initially many didn’t, but that’s starting to change, said Expect Labs co-founder and CEO Tim Tuttle. There are about a thousand developers building on the API right now, and the vast improvements in speech recognition over the past several months alone has helped pique their interest in voice. He doesn’t think every application is ideal for a voice interface, but he does think it’s ideal for those situations where people need to sort through a large number of choices. “If you get voice right … it can actually be much, much faster to help users find what they need,” he explained, because it’s easier and faster to refine searches when you don’t have to think about what to type and actually type it. A demo of MindMeld voice search, in which I learned Loren Avedon plays a kickboxer in more than one movie. Of course, that type of experience requires more than just speech recognition, it also requires the natural language processing and indexing capabilities that are Expect Labs’ bread and butter. Tuttle cited some big breakthroughs in those areas over the past couple of years, as well, and said one of his company’s big challenges is keeping up with those advances as they scale from words up to paragraphs of text. It needs to understand the state of the art, and also be able to hone in the sweet spot for voice interfaces that probably lies somewhere between them. “People are still trying to figure out what the logical unit of the human brain is and replicate that,” he said. Check out Tuttle’s session at Structure Data 2014 below. Structure Data 2015 takes place March 18-19 in New York, and covers all things data, from Hadoop to quantum computing, and from BuzzFeed to crime prediction.